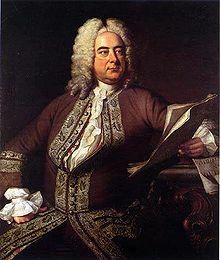 Foundling Hospital Anthem by George Frideric Handel (1685-1759). Edited by Donald Burrows. For SSAT Vocal Soli, SATB Chorus, [0.2.0.1-0.2.0.0], Timpani, Strings, Basso continuo. This edition: Cloth-bound, hardcover. First Performance: May 27th, 1749. Choral. Full score. Text Language: English. Duration 32 minutes. Published by Edition Peters (PE.PB7227). This entry was posted in Handel, George F. (1685-1759) and tagged Academy of Ancient Music, album, Blessed is he that considereth the poor, Choir of Christ Church Cathedral, CPDL, English, Foundling Hospital Anthem, Psalm, Psalm 41, Psalm 41:1, Psalm 41:2, Psalm 41:3, sheet, YouTube by John. Bookmark the permalink.